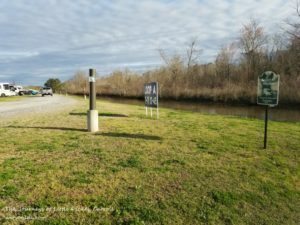 We arrived at the Aviation Arbor RV Park on Naval Air Station/Joint Reserve Base (NAS/JRB) New Orleans, in Belle Chasse, Louisiana, about Noon on Thursday February 8th, having taken a couple of days to work our way down from Hot Springs, Arkansas. The previous evening we spent the night at the Eastbound I-10 Milepost 2 Mississippi Welcome Center, having been unable to find a parking spot for nearly 200 miles of Louisiana Highways. 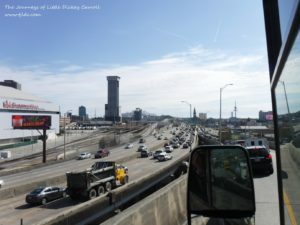 We arrived after dark and were glumly idling our way past all of the full parking stalls overflowing with 18-wheelers when the night time security guard (24-hour security is common in many southern state Rest Areas) suddenly cut in front of us in a golf cart. I silently called him any number of impolite names since he scared the heck out of me but refrained from honking my horn or opening my window and heaping upon him the verbal abuse it appeared he so richly deserved. Danged good thing I remained outwardly calm because he led around a corner and pointed us at a pull-through parking spot off the side of the drive. All the “No Overnight Parking” signs we’d seen on our way through the Rest Area at that point had apparently only been for the specific vicinity of each sign, not for the Rest Area itself. Each parking spot along the drive was pretty well isolated from others and we had no irritating generators, refrigeration units, or idling diesel engines to bother us all night. And when the sun came up Thursday Morning, we found ourselves in a parking site that better than many campgrounds I’ve paid good money for! 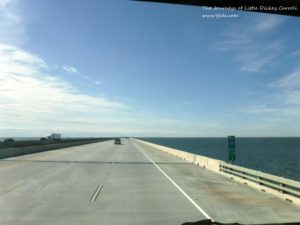 As we crossed Lake Pontchartrain on our approach to New Orleans, I was continuing my band-surfing in search of a decent radio station when I had an electronic collision with WWOZ 90.7 FM New Orleans, “Dedicated to bringing the music and culture of New Orleans to the universe.” That became my listening venue of choice for the remainder of our New Orleans stay, and if you’re not in range to synchronize your Frequency de-Modulator with 90.7 MHz HD1, then definitely deploy your favorite browser on the Information Super Highway to resolve https://www.wwoz.org for a little streaming relaxation. They play a great mix of Jazz and R&B that will bring out your mellow while getting your toes to tapping. The light traffic that we’d enjoyed on the outskirts of New Orleans definitely became heavier, and by the time we’d reached downtown, we were crawling past the Mercedes Benz Superdome into the exit from I-10 and onto the US Business Highway that crossed the Mississippi River and routed us toward Belle Chasse. 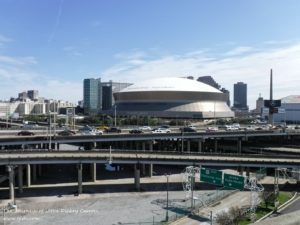 New Orleans Traffic – it’s not all Big Easy! 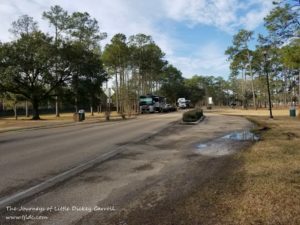 The RV Park is a great deal for anyone authorized to use US Military Facilities – Only $18 per night, and there were plenty of open spaces during the week leading up to Mardi Gras. 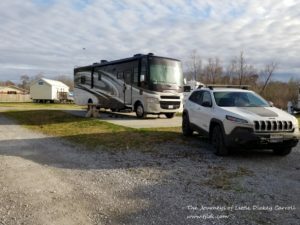 We scored a nice pull-through site (much in demand for motorhome campers because you typically do not need to unhook your towed vehicle before you park) with full concrete pad, water, sewer, and 50-Amp electrical service. If you’re eligible and don’t mind the odd EA-6B Prowler taking off, flights of FA-18 Hornets in the traffic pattern, the occasional Huey helicopter, and even a C-130 doing ramp run-ups (all naturally filtered out as the sounds of freedom by the minds of the soldiers, sailors, marines, and airmen and their families stationed around military bases) this is a fantastic place to stop over. Even the sign warning “Beware of Alligator – Please Do not feed the wildlife” added a lighter note to a hazard common in the southeastern US. Please Don’t Feed the Wildlife – You might be on the Menu! 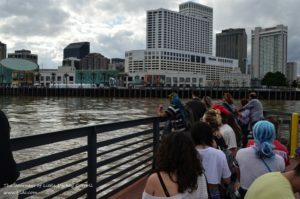 Friday afternoon, after picking up some tips from the locals on how best to approach the city, we headed out to historic Point Algiers (founded nearly 300 years ago in 1719), a few miles distant from Belle Chasse, to catch the city-run ferry into New Orleans (http://www.norta.com/Maps-Schedules/New-Orleans-Ferry). We parked in a private lot nestled up against the dike and run by local entrepreneurs reminiscent of “event parking” around the Puyallup Fairgrounds. A gentleman was seated at the entry booth, ambling over to our car as I pulled into the drive. “How much?” I asked. 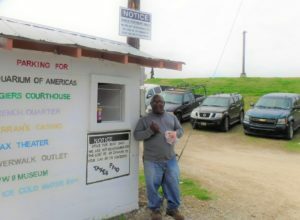 “Twenty bucks” he replied holding out his hand and accepting the twenty I handed him. He waved me in and on toward a young man who pointed to a spot that had just emptied. I understand that the parking fees vary with whatever is going on a particular day or evening. The busier they are, the higher the fee, in a classic demonstration of price elasticity of demand. 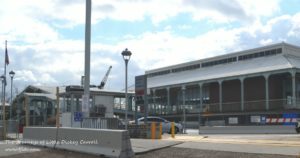 Although parking is a bit pricey (admittedly less than I’ve paid in downtown Seattle on occasion and we later found out that it was nearly twice as much at downtown lots – saw one sign proudly advertising 2-5 hours for $34, and 5-8 hours for $39) the ferry was dirt cheap. Since Darling-Darling and I are both “Seniors” the fare was a dollar apiece into the City, and the same to return, cash only. 4 bucks total for transportation plus 20 bucks for parking was a heck of a lot more convenient, faster, and significantly cheaper than it would have been to try to drive over there and then find and pay for parking! 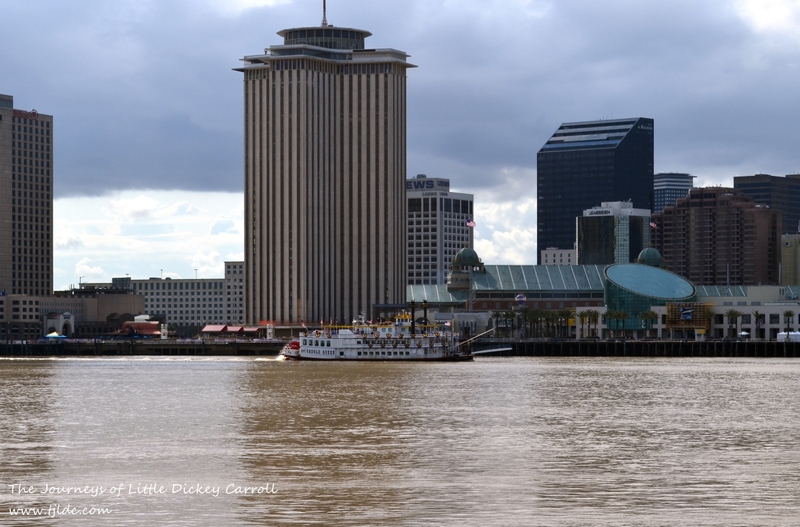 The ferry runs every half-hour, on the half-hour into the city, and on the quarter-hour to return. 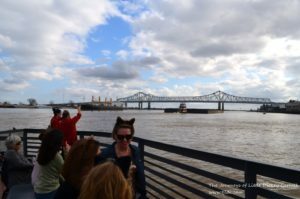 We’d missed the boat by about 5 minutes but that was just fine because it gave us time to figure out what was going on and where we needed to be as well as observing downtown New Orleans and doing a little people watching. We quickly figured out that this wasn’t Alabama or Arkansas Dry County Territory! 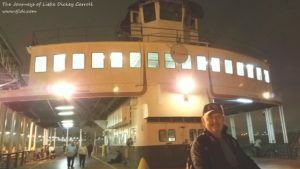 It was more likely than not that the folks waiting for the ferry with us had an alcoholic beverage in their hand preparing for the party, and one young man had a 30-pack of Busch Natural Light under his arm that he and his friends were making lighter by the moment. 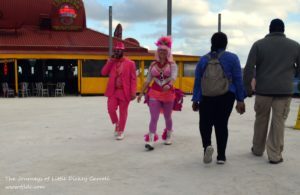 Many of our fellow passengers were dressed, partially dressed, or nearly undressed as they felt appropriate. The bead-collectors were readily identifiable by their very short cut-off t-shirts and similarly revealing or loose clothing. And now I have a really good idea where a couple of my former Weyerhaeuser/Verizon colleagues procured their bright pink wigs! Party Time is almost here! 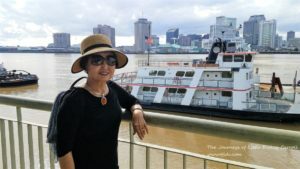 Waiting for the ferry, we had the opportunity to view not only the city across river, but the heavy commercial traffic, including ocean going freighters, tug/barge combinations, and the occasional replica stern wheel Mississippi river boat. Boarding the ferry for the quick trip we traversed between more traffic and noted the US Coast Guard inflatable, complete with bow-mounted M-60 7.62mm (.30 caliber) machine gun. 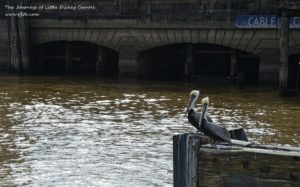 The Canal Street Ferry Terminal in the City was watched over by pelican sentinels, who were not disturbed in the least by the ferry docking at their guard station. Off the ferry and enroute to the RiverWalk Outlet Collection (where else would we start our tour of this 300-year-old center of commerce and culture?) we encountered our first costumed revelers all decked out to party hearty. We would see many more over the coming days. The first fully costumed revelers we encountered. Many more would follow. Having worked up her appetite by the strenuous exercise at the outlet mall, Darling-Darling wanted some lunch, and wanted it NOW. We ended up at Mother’s Restaurant for lunch. Since Blue Crab (her first choice) was out of season, Darling-Darling had the Half-Half Seafood Platter with shrimp and calamari and I had the sampler platter, along with a sample of Abita Brewing Company’s (Covington, LA, north of New Orleans on the far side of Lake Pontchartrain) tasty Amber Ale. 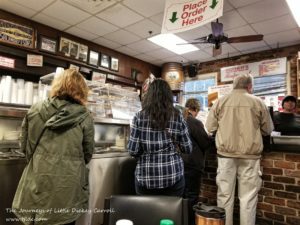 Mother’s restaurant has been a staple of New Orleans for nearly 80 years serving “the world’s best baked ham.” (Mothers’ Restaurant Menu) They take your order cafeteria style, you pay up front, then you find a place to sit and the wait staff picks up your receipt so they can match your order to your table. After a short while, your food is delivered hot and tasty, accompanied by your choice of a variety of deep south side dishes such as green beans and tomatoes, red beans and rice, turnip greens, cabbage, grits, etc. No tipping is allowed, so the prices you see are the prices you pay. 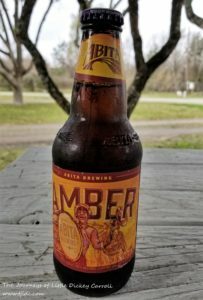 Abita Amber Ale – a tasty addition to a spicy meal. Cafeteria-style ordering with table service. No tipping allowed. After lunch we wandered up Canal Street for a distance, looking in shop windows and watching all the different partiers. If your thirst was on and your beverage container was empty, you didn’t even need to go into a bar – just stop at the nearby sidewalk stand selling a variety of beverages of your choice! 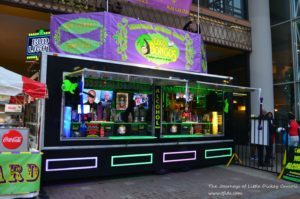 This New Orleans lemonade stand isn’t exactly what you’d want your kids to put up on the corner! As it got later in the day, crews began setting up barricades for one of the many daily parades. 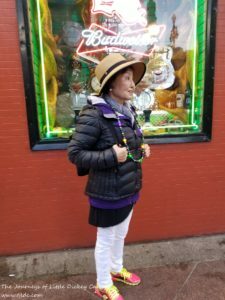 No one could tell us what time the parade was supposed to reach our location and it was starting to rain, so Darling-Darling decided we could see a parade another day and as it began to get dark, we headed back to the ferry terminal. 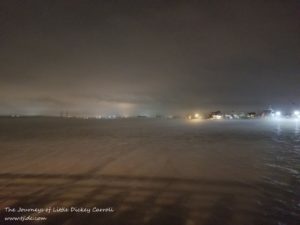 As the fog rolled in and the night mist rose up from the river, we returned to Point Algiers and our trusty Jeep for the drive back to Belle Chasse. The return Ferry approaches through rising river mist. LDC on the ferry after an enjoyable day. 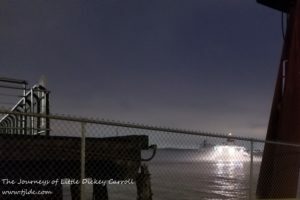 The Point Algiers Ferry Terminal through the incoming fog and the rising mist.